Andreev, Jordan; Lazarov, Ivan; Pavlov, Plamen. 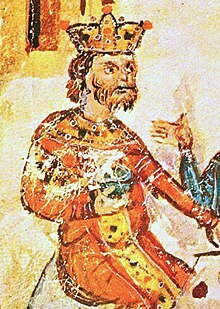 Кой кой е в средновековна България (Who is Who in Medieval Bulgaria). Sofia. 1999 （保加利亚语）. Fine Jr., John V. A. The Early Medieval Balkans. Ann Arbor. 1983. Gibbon, Edward. Chapter LV, The Bulgarians, the Hungarians and the Russians. The History of the Decline and Fall of the Roman Empire V. London: Strahan & Cadell. 1788–89. (primary source) Iman, Bahši. Džagfar Tarihy (vol. III). Orenburg. 1997. (primary source) Syrien, patriarch of the Syrians Jacobites, Michel le. t. III. (编) J.–B. Chabot. Chronique de Michel le Syrien. Paris: J.–B. Chabot. 1905: 17 （法语）. Norwich, John J. Byzantium: The Apogee. Alfred A. Knopf, Inc. 1991. ISBN 0-394-53779-3.